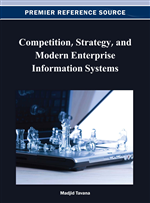 Developing and sustaining a competitive advantage from the use of information technology is a topic of concern for information systems research. Mata et al. (1995) present a model that is founded on the resource-based view of the firm. The model is used to discuss factors that lead to competitive advantage in e-commerce companies. This paper explores factors that enable sustainable competitive advantages in B2C retailing. The analysis is based on a single in-depth case study of an Internet pioneer company (LeShop), which was observed by the authors since its inception more than 10 years ago. The research data stems from a series of interviews with managers at LeShop as well as two case studies about the company from two different points in time (2000 and 2009). LeShop is an online pioneer, which began selling groceries on the Internet in Switzerland in April 1998. After a turbulent few years, LeShop is now one of the few successful e-commerce suppliers in the supermarket segment worldwide. The discussion includes an analysis of further critical resources of the company from a resource-based view. Considerable research interest was directed at the topic of e-commerce in the period 1997-2003. The first influential articles on the topic focused on general discussion of the definition and influences of the Internet on company strategy (Wigand, 1997; Porter, 2001). The research literature about e-commerce and online grocery retailing in particular is dominated by research from the customer view. It focuses on the motivational factors for customers to engage in e-commerce, e.g. security, trust, convenience, prices and others (Jarvenpaa & Todd, 1997; Elliot & Fowell, 2000; Khalifa & Lymayem, 2003; Wang & Emurian, 2005; Mukhopadhyay et al., 2008) or on the changes e-commerce brings about in the value chain, in particular channel management and disintermediation (Gallaugher, 2002). Less research attention has been directed towards understanding how online retailers achieve success and a sustainable competitive advantage in a highly competitive, low-margin industry sector (in our case food retailing). Using empirical data from a longitudinal in-depth case study, this paper contributes to a deeper understanding of the factors that enable a company to successfully operate in an e-commerce environment. We base our analysis on a longitudinal in-depth case study of a pure online player – a typical start-up company of the early e-commerce boom years (such as Dell and Amazon). Unlike these well-known American online players, this company (LeShop) is a small Swiss company which operates in the low margin segment of food sales. At the time of writing this case analysis, the authors have been monitoring the company for more than 12 years. In our analysis we were interested in the factors that lead to success for an online player. Examining the existing literature we identified a lack of longitudinal case studies with a focus on the view of a pure online player. To provide a longitudinal view, we use the concept of sustainable competitive advantage as our scientific lens. We base our discussion on the framework by Mata et al. (1995), which uses the resource-based view as a basis to discuss the possibilities of IT as a competitive advantage. More specifically, we explore the factors that enable sustainable competitive advantages for our case company LeShop and seek to generalize our findings for B2C online retailing. Our research identifies important factors that online players might consider when defining their e-business strategy. Our case analysis is situated in the online food market, which is a particularly challenging industry with low margins, high volumes and sophisticated supply nets. In this industry we find interesting failure stories such as the ones of PeaPod or Webvan, American start-up companies, the latter of which spent the impressive amount of 1 billion US$ in building up an expensive infrastructure including a fleet of vans, automated warehouses and sophisticated devices for their delivery staff (Himmelstein & Khermouch, 2001) before it had to close down its operations. On the other hand, the same industry boasts a small number of successful companies such as UK-based Tesco that have been successful in extending their online business over the years (Delaney-Klinger et al., 2003). It is notable however that Tesco built from its already strong position as a brick-and-mortar grocery retailer. Our case company, LeShop, is a small but fast-growing Swiss food retailer. The success of the company is particularly noteworthy due to its operations in the low-margin and logistically extremely demanding food and supermarket segment. The company has diversified increasingly over the last years and sees itself as an online shopping store for a wide range of products. This case study highlights the state of the business concept and its operational implementation after more than 10 years of operation in this industry. The aim of this paper is to provide an analysis of the development of LeShop and to investigate the factors that were decisive for its survival.